The theme of attending school is in so many kids books. Every time we read and school shows up the questions start. 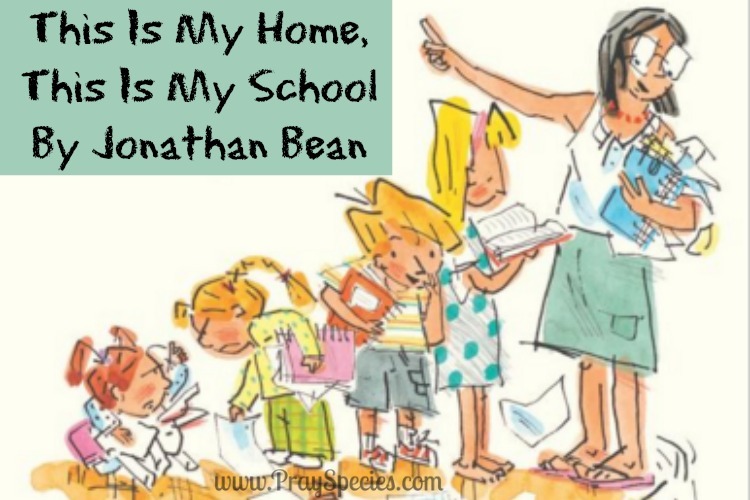 But, now I can answer by reading “This Is My Home, This Is My School,” by Jonathan Bean. The author is a grown up home schooled kid with award winning books to his credit! The pages are literally filled with busy illustrations of the author on his journey as a home schooler. Every room in and out of their house is a classroom. Science happens in the kitchen. Woodshop is in the shed. PE is in the backyard, and occasionally taught by the substitute teacher, Dad. A passion and commitment to learning and family lift themselves from the pages, accompanied by good humor and authenticity. 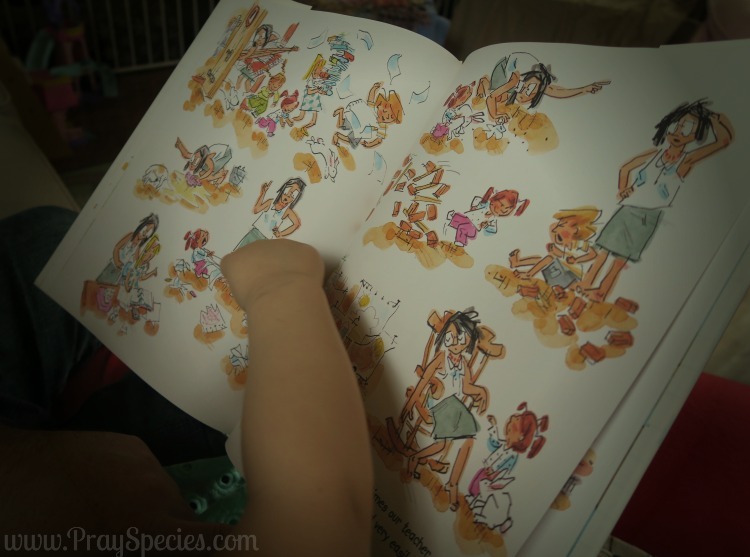 If you are planning to home school like I am you’ll laugh, not only with relief at FINALLY finding a good picture book about home schooling, but also at all the subtle, but glaringly real aspects of being a home schooling family. The little details. The nuances in the illustrations. The love of family. Big sister spends almost every page with her nose in a book. Baby sister is always making trouble….at least from big brother, the author’s perspective. The dog and rabbit wreak havoc. A field trip is taken in the school bus, identified by convention as the family van. Mom wears out and the kids are shocked that she tires so easily. Haha! This humorous anecdote follows a slew of images of Mom helping with school work, completing chores, referring sibling squabbles, cleaning up after the dog, the rabbit, the kids, etc. etc., etc. The illustrations are VERY busy and initially can be overwhelming. I have to admit that initially I wasn’t sure if I was going to like the book. My kids took to it instantly. The more I read the story, the more the pictures and the story started to grow on me. The more I appreciated so many little details that provide humor for parents as well as kids. Real pictures of the author and his siblings in their home, their school are found in the final pages. As a Mom this book is inspiring and funny. For my kids, the story show cases a new perspective that normalizes a very real future part of their lives. Because This Is Their Home, This is Their School. 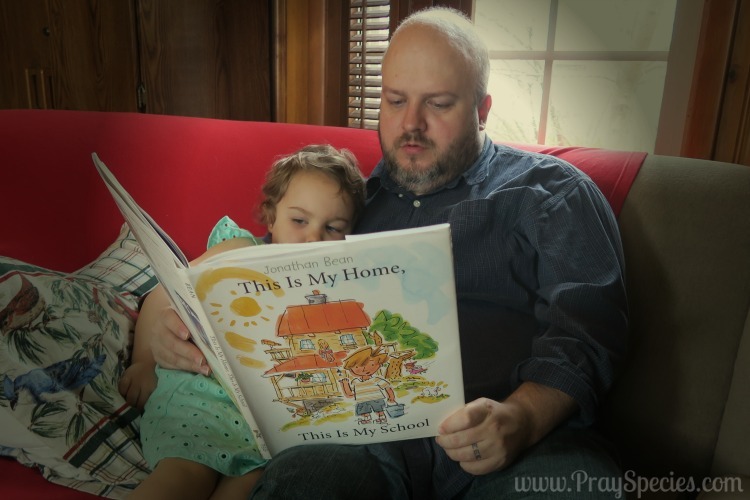 Do you know of any great reads for families preparing to home school?